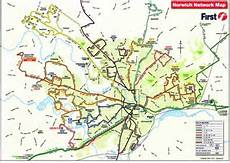 Most bus routes in Norfolk are wheelchair accessible. People with disabilities have identified a number of on going problems which may cause delay or confusion. The interior of the buses vary. 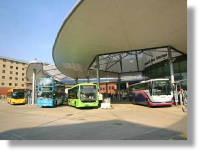 Buses don't stop at their right stand in the bus station or don't stop in the right place at bus stops. Buses take different routes unexpectedly at the weekend and the drivers don't announce this which can cause delays to journeys and lots of confusion. There are not enough seats and many of the standing spaces and wheelchair bays are often taken by parents with buggies. Some drivers are exempt from operating the manual ramps due to serious back complaints and consequently refuse to operate them. If you do encounter a problem using the buses then please go to the company's web site (see below) and complain! First buses launch new cards to improve people’s experiences of travelling on their buses. The idea is to give disabled people a way of letting the driver know that they may need additional help. It may be that you need more time to reach your seat or that you want the driver to speak up because you are hard of hearing. Whatever your need, you can use these cards to let the driver know in a private and discreet way. 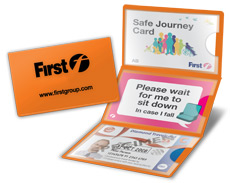 Available in Norfolk and Suffolk, Safe and Better Journey Cards are intended to make journeys more enjoyable – there are even blank spaces for you to fill in yourself for details of your destination or special instructions.